It still might not have soaked in yet that half of the NFC East teams are looking for new head coaches and that does not include the Washington Redskins. The NFC East champions actually have more important things on their mind: Aaron Rodgers and the Green Bay Packers. Defensive backs coach Perry Fewell has been working with an undermanned unit all year and that will likely continue on Sunday. The banged up secondary is just one aspect of the Redskins injury report heading into the playoffs. The Washington Redskins have clinched the NFC East division and are locked into the fourth seed of the playoffs, but must finish out the regular season against the Dallas Cowboys before getting set to host an unknown foe. Although it is expected for Jay Gruden to rest the banged up Redskins, he still has the “intent of playing guys that are going to be healthy.” As a result, the likes of Kirk Cousins and Jordan Reed will start for at least a set amount of snaps. With the biggest game of the season approaching, a Saturday night matchup with the Philadelphia Eagles for the chance to represent the NFC East in the playoffs, the Washington Redskins are hoping for positive news on the injury front as the week progresses. Washington has shown that they are capable of playing competitive football, but Scot McCloughan has not had enough time to put together a team that can withstand so many injuries. With 14 players already on the season ending injured reserve list, the Redskins can ill afford losing any more bodies following the Bills game. With the shortened week, Washington will hold walkthroughs on Tuesday and Friday that sandwich “two good days of practice” on Wednesday and Thursday. The Washington Redskins entered Sunday’s game with the New York Giants with several issues on the line. First and foremost, a win would lift the Redskins into first place in the NFC East, tied with the Giants at 5-6 but ahead on tiebreakers. The Skins also came in winners of four straight in the friendly confines of FedEx Field. However, the Redskins have had trouble with the Giants in particular in recent years, having not won against their division foe since Dec. 3, 2012. Kirk Cousins threw for 302 yards, hooking up with DeSean Jackson for a 63-yard touchdown, Alfred Morris enjoyed his best day in a while with 78 yards on 23 carries and the Redskins knocked off the Giants 20-14 to vault into the lead of the moribund NFC East in the process. The Redskins defense gave up 321 yards passing to Eli Manning, and Odell Beckham Jr. had 142 yards on nine catches, including a spectacular one-handed diving catch to make it a one-score game late, but limited the G-Men to 33 yards rushing and picked off Manning thrice as they bounced back from the thrashing they took at the hands of Cam Newton and the Carolina Panthers last week to insinuate themselves into playoff talk in the NFC. Following a tough loss to the Super Bowl champion New England Patriots on Sunday, Washington Redskins head coach Jay Gruden addressed the media on Monday to discuss the self-inflicted wounds and moving on to the New Orleans Saints. The only injury concern that will be monitored throughout the week on Sunday was a hamstring strain for FS DaShon Goldson. Gruden said little about DeAngelo Hall and Kory Lichtensteiger besides that they are still progressing. Gruden does not know if Terrance Knighton‘s migraines will keep him out long-term, but he certainly hopes he does not loose another member of his defense in his massive nose tackle. Gruden said “clearly we’re disappointed with the [New England] game, but it’s important to move on to New Orleans”. The astounding eight dropped passes yesterday was abnormal and Gruden hopes that “we got them all out of our system” because such a problem is destined to doom an offense on a consistent basis. Things could have turned out a lot differently if Pierre Garcon catches the Redskins first offensive play instead of the pass resulting in a pick or if Derek Carrier hauls in the beautiful touch pass from Cousins in stride. With the regards to the continued terrible running game that produced just 37 yards, Gruden repeated the same old tune. It has to do with everyone from missed blocks on the offensive line, backs missing holes and/or not running through tackles, etc. Some of the run struggles with the offensive line are chalked up to youth by Gruden, which is understandable since the team has been unable to run the ball ever since the losses of Shawn Lauvao and Kory Lichtensteiger. Gruden said that he does not expect a finished product for a while. Between the drops and non-existent running game, it is no surprise that the Redskins could muster up just a field goal before a touchdown during garbage time. With regards to Kirk Cousins, who in my opinion did not play anywhere as poorly as the rest of the offense, Gruden commented on his decision making. “Sometimes Kirk Can overthink some things…he’s got to be decisive with the decisions he makes”. After being a team that got out to an early lead just to give it away at the end earlier in the season, the Redskins have seen themselves fall into 24 and 17 point holes over the past two games. Gruden stressed the importance of a quicker start against the Saints because “we can’t keep putting ourselves in 17 point holes”. With the return of the speedy DeSean Jackson, many fans thought that all the offensive woes would be fixed instantly. That was far from the case as Jackson was targeted just three times prior to the fourth quarter. Gruden said that cohesion was stunted by Jackson’s absence in voluntary OTAs and training camp to explain the lack of involvement from the receiver. The lack of run defense starts, but unfortunately does not end, with the pitiful play from inside linebacker Perry Riley, who’s struggles in coverage are a completely different story. Riley was juked twice in the hole within the Patriots first three runs of the game. Finally the coaching staff had enough and decided to play Will Compton in an increase role at inside linebacker. This does not mean that Riley will not start against the Saints, but Gruden also did not rule out that possibility. On the last day of practice before the Washington Redskins will take some time off during the bye week, Jay Gruden addressed the media on what will be transpiring behind closed doors. With regards to injury, Gruden did not want to “project and guess” of who would be available against the patriots but did admit he has “high hopes for the majority of them”. Gruden’s main message to his players was to “get their bodies healthy” both physically and mentally. Although some may see it is unfair during their time off, I think Gruden was correct to ask the team to “tune in” to New England’s matchup against the Dolphins Thursday night as another step to be “mentally ready to go”. Before heading into the bye week, head coach Jay Gruden took the time to address the Washington Redskins lengthy injury report. 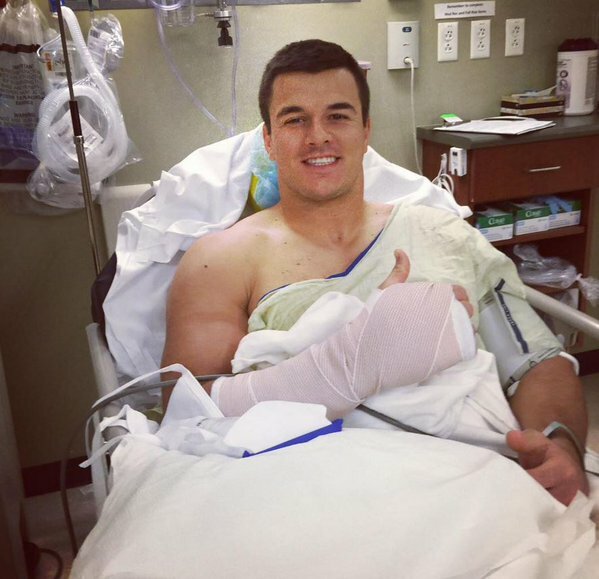 As reported yesterday, Ryan Kerrigan broke a bone in his hand sidelining him for all of the second half. Today the pass rusher had surgery on his third metacarpal bone and he will see the surgeon next week to determine whether or not there is a chance for him to play against the Patriots. Although this would seem to be a major blow to the Redskins defense, the fact that there is a chance Kerrigan will not miss any playing time is a positive. Gruden confirmed that Kerrigan would play with a cast or other kind of protection when he returns, which could hinder a defenders ability to grab on the pass rush. The injuries continue to be a topic of concern for the Washington Redskins, which was the topic of discussion for the majority of Jay Gruden‘s media availability. However, new defensive coordinator Joe Barry was able to discuss football through evaluations of the past and looking forward to the upcoming game against the Tampa Bay Buccaneers. The one football game related point that Gruden discussed was what a healthy Jordan Reed would do to jumpstart the Redskins sputtering offense. Having Reed available will add the element of long completions back into the playbook, which Gruden knows needs to be done in order to help the run game. With Reed being a major mismatch against most linebackers and safeties, the Florida product should be able to continuously sit down in the middle of the field behind eight man fronts that are trying to stop the run. Then teams will be unable to simply commit to the run as they have been for much of the past two games.